In the early 1970s, the radical jazz-poet Gill Scott-Heron wrote: “The revolution will not be televised.” That soon became a slogan among the left-leaning movements of the time. Scott-Heron ended his poem with telling lines, even plagiarising a few words from a well-known commercial jingle: “It will put you in the driver’s seat! During the past three weeks, this week and perhaps into those that will follow, it would appear that Gill Scott-Heron has been proved both right and wrong. The political revolutions we have witnessed in Tunisia and Egypt were indeed televised. They put ordinary people — Scott-Heron’s virtual audience — in the driver’s seat. And they were live! The extraordinary outpouring of decades of pent-up frustrations and rage against authoritarian governments by the mass of ordinary citizens, led by a generation of young people who take modern information and communications technology (ICT) for granted, brought home to the world the astonishing power that has been placed in the hands of the citizen by these technologies, and the transformative capacity of what Alvin Toffler called the “Third Wave”. One needs to underscore the role played by both social networks, such as Twitter, YouTube, Facebook, Google and the international television networks, not merely in reporting on and communicating these events to an international audience, but also their use as organising tools to mobilise thousands of cyber-hip young Tunisians and Egyptians onto the streets. Word of mouth and other conventional means of communication invariably supplemented the ICTs, bringing together Muslims, Coptic Christians, liberals, socialists, nationalists and Communists in an impressive display of an anti-authoritarian united front reminiscent of the events in SA in the 1980s. What we see unfolding in the north of Africa, in Yemen, Bahrain, Libya, Iran (and who knows where else) may be the best communicated, documented, media-ready and media-driven political upheaval of modern times. The governments could not contain, let alone suppress these movements because the development of ICT has outstripped conventional methods of controlling the flow of information and the capacity of governments to censor it. It has placed in the hands of the common citizen the means to disseminate, communicate, record and document his/her experience, employing affordable electronic equipment that is consequently accessible to thousands who have the discretionary funds. Information flowed unimpeded and unmediated between and among people who had access to this technology. They, in turn, could pass it on to others. Any bit of information that could be digitised, from the human voice to moving images, flooded the airwaves. We had, it seemed, arrived in Marshall McLuhan’s “global village”. ICT shrank the size of our planet so that people in Cape Town could not only witness, in real time, what was happening at the other end of our continent, but could become virtual active participants if they spoke, read and wrote Arabic. The information highway came into its own. Not only was its power vindicated, but also, most importantly, its capacity to empower both the individual and the collective was incontrovertibly demonstrated. Four weeks ago, we saw the other side of this coin. On Sunday, 16 January I was awakened by anxious citizens, alarmed by a rumour that Nelson Mandela had passed away. That rumour was being “tweeted” around the country by unknown persons, either motivated by a macabre sense of humour or by plain mischief. Though I was absolutely certain the information was incorrect, I nonetheless found myself apprehensively calling members of the Mandela family; colleagues in the ANC leadership and even the head of VIP protection in the SA Police Service, to reassure myself that the rumour was unfounded. Modern communications technology is evidently a two-edged instrument that can be harnessed for social good, but also for terrible mischief. The citizens of New York had experience of both these dimensions of what was then the most revolutionary communications tool, radio, when Orson Welles and his colleagues broadcast a radio play, based on HG Wells’s The War of the Worlds as if it was unfolding in real time. Literally hundreds of people who heard that broadcast believed that the planet earth was under attack from Martians and took flight from their homes. Only later did they discover that it was merely a radio play, being performed by a group of over-zealous artists whose creativity had gotten the better of them. A similar scenario almost unfolded in Gauteng four years ago. On that occasion some mischief-makers called in warnings of a tornado heading towards Johannesburg to a number of radio stations. Had the SA Weather Service not intervened timeously, the highways, already clogged with anxious motorists heading home or away from the city, might have become unusable. Had a major panic ensued, the consequences could have been disastrous. Those who have seen the movie Hotel Rwanda will also be aware of the genocidal role played by unregulated commercial radio in the terrible events that took place in that country. It is important that we bear both these two dimensions of the power of modern ICT in mind when discussing the significance of the Cairo events. Can the same thing be said of other young people, especially those living in sub-Saharan Africa? The digital gap between the “information haves” and “have-nots” is perhaps most profound in these regions of our continent. What Alvin Toffler referred to as “The Third Wave” differs from the previous agrarian and industrial revolutions because of its reliance on the technological innovations of the latter half of the 20th century. Telecommunications is the backbone of the digitised information revolution and the key infrastructure for its development and efficacy. Though there have been impressive improvements, especially with respect to access to the cellphone, on the African continent, our continent still lags far behind the rest of the world in this regard. A single statistic illustrates my point: there are more fixed lines on the little island of Manhattan, New York City, than on the entire African continent! With the increase in the intelligence of networks and devices, as well as mobile bandwidth, the capacity to communicate seamlessly has grown by leaps and bounds, as the events unfolding in North Africa and other parts of the Middle East demonstrate. As we have seen, information of every stripe and variety has become available to ordinary citizens thanks to modern ICT. But the capacity of citizens to access it, to employ it and to communicate with it, is still highly constrained and very uneven. The gap between the “information rich” and the “information poor” is quite evident amongst the various regions of the world. In general terms one could say people in the developed countries enjoy far greater access to ICT, while a privileged stratum — mostly young — in the developing countries can use it. In SA, that divide also has regional, racial, gender and class dimensions: non-English-speaking rural communities are the worst affected. English-speaking urban communities are the best endowed. Closing that digital gap requires intelligent interventions. The growth, development and sophistication of our telecoms infrastructure self-evidently must be our starting point. That will not only enhance the capacity of our citizens to communicate amongst themselves and the rest of the world, but will also have an immediate impact on economic growth. We have already witnessed the social and political impact of the cellular phone on SA. Cellphones have been extensively used as the principal communications tool amongst delegates at ANC elective conferences. Polokwane being a case in point. The MDC of Zimbabwe used the same cellular technology to collect and collate election results from polling stations spread across that country, parallel with the official electoral commission that conducted Zimbabwe’s last general elections. Reports indicate that an ICT company in Nigeria has developed the software needed to prepare that county’s electoral register, while another has developed the hardware that will make Nigeria less dependent on equipment imported from the east or the west. If sub-Saharan Africa is not to be left behind, should SA not establish itself as the telecoms port for international traffic to and from the continent? Given the relative sophistication of our existing telecoms infrastructure, that could be the platform for the digitisation of sub-Saharan Africa. Even our harshest critics cannot deny that SA owes its access to the information highway to the ANC-led government and the telecoms policies it has pursued since 1994. We created the enabling environment for ICT in this country to blossom. It is our policies that have led to the proliferation of social networks, blogging, YouTube, tweeting and the new forms of citizen journalism. That the ANC-led alliance has struggled for and defended media freedom is a matter of historical record. Is it not time for our movement to consider in earnest the dilemma we have placed ourselves in by creating the impression that we wish to control and otherwise constrain the free flow of information in our society? The harsh realities are that a course of action that compromises our proud record as advocates and defenders of media freedom, will hand our standards to those who have, at best, been equivocal about these freedoms when they have not actively suppressed them. The challenge today is developing and securing a truly diverse media during a digitised age when print might well be on its way out and in an environment where engaged citizens will use the very infrastructure we have set in place to communicate and disseminate information amongst themselves, unmediated by corporations or governments. As Gill Scott-Heron predicted, “the revolution will be live”. And your government was once one of the biggest supporters of the likes of Gaddafi. The hypocrisy of claiming to support the revolutions when the ANC has yet to meet a murderous dictator it didn’t like – indeed going as far as to provide succuour to the Ivory Coast incumbent as he burns his country down – is nothing short of astonishing. It made for very interesting reading, until I read the last few paragraphs. It then turned into an ANC election speech. 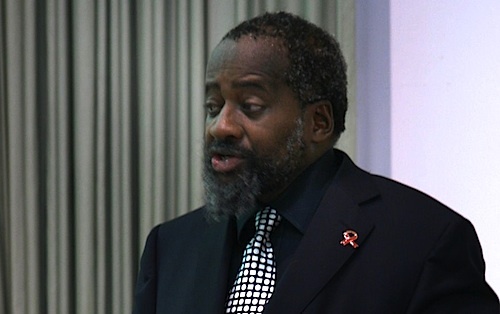 Has Mr Pallo Jordan been asleep the last few years. It took a court case to get things moving again. They tried to stop the sale of Vodacom and the Digital Television migration have been delayed years by the ANC. This is just two examples. It’s going to take a lot of effort from our new Communications minister Roy Padayachie to undo the mess. We could have been a lot further.